Despite a fascination for Italy, I haven't read many stories set in this beautiful country. There was Cornelia Funke's wonderful 'The Thief Lord' which I read to my children and another YA book who's title eludes me and now this, an adult historical fiction set in Venice. 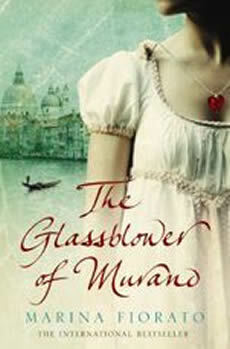 The name Murano drew me to this book. I had only heard this name in association with the glass beads that are so popular at the moment and I was fascinated to discover that Murano glass is Venetian glass and has been made for centuries. The story crosses between Corradino Manin, a great glassblower of Venice in the 1600s and Nora Manin, an English girl with a Venetian father, from the present day. Escaping from an unhappy life, Nora returns to Venice dreaming of using her glassblowing skills in one of the famous Venetian glass factories. Nora unveils the secrets of her ancestor - the great Corradino, the story playing out against a background of Venetian history and the intricacies of glassmaking. This is a book which not only tells a great story, but paints a perfect picture of Venice and illustrates the intricacies of glassblowing. I highly recommend it. This is an entry in the Historical Fiction Reading Challenge. Sounds facinating. Must add to my TBR pile. The colder it gets the more I seem to read! It's gotta be good for something.